Posted 6/15/2013 2:50pm by Sarah VanHorn. 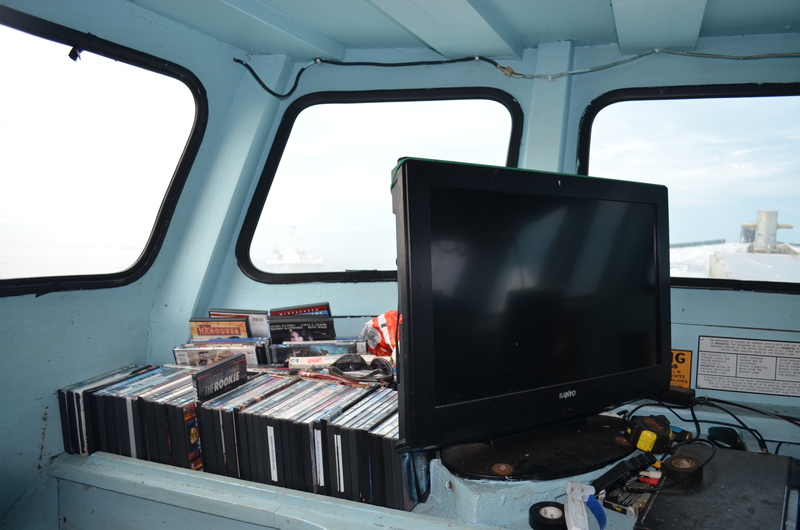 “My boat has all the comforts of home, it's just noisier," jokes fisherman Neal Pike of Seabrook, New Hampshire as he pops in the first DVD of the morning at 4:30 am. On his 42 foot '85 Novi, Sandi Lynn, which he bought in 1997 we set out in search of whiting, the plan for the day being 2-3 tows for about an hour or more each. 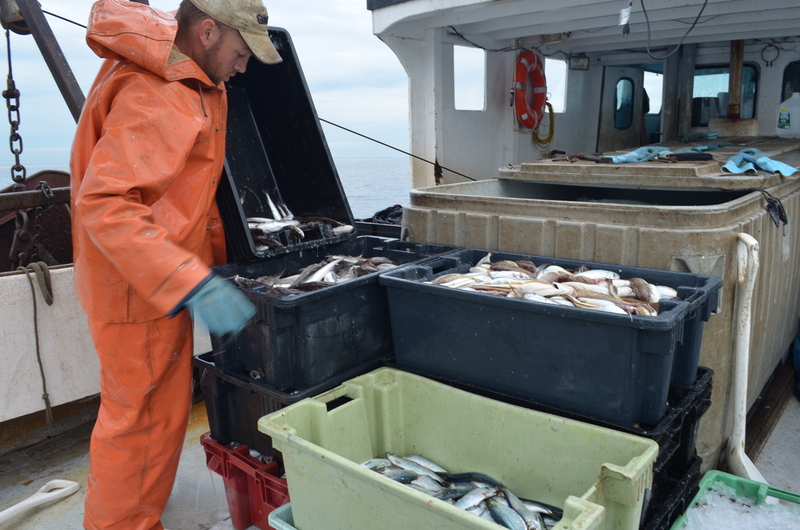 This time of year Neal targets whiting, herring, mud hake, and an assortment of other bait fish used by other fishermen as well as lobstermen. "I fish all year round," says Neal, "I try not to fish 7 days a week, but sometimes it just works out that way." Neal typically fishes with one other deckhand onboard, and as of lately, that has been his son, also Neal Pike, who's been fishing with his father on and off for as long as he can remember. He shares one memory of his father cutting a pair of skins, or fishing overalls, at the knee so they would be his size. When I ask Neal if he has any other children, he jokes, "When you get perfection, you just stop." His son, a law school graduate who's had difficulty finding work in his field, lets out a laugh and continues pulling on his skins in preparation for the first tow of the morning. When asked why he fishes, Neal responds, "I love it, I really do. I just like being out here on my own." He pauses to reflect, "It used to be a lot of fun, but the government's slowly been taking all the fun out of it." Neal Pike has been fishing since high school, starting in 1975. By the age of 23 he had a boat of his own, with which he started out lobstering and later switched to dragging. He describes fishing as being different than what it used to be. "You have to be computer-smart now, it never used to be that way." 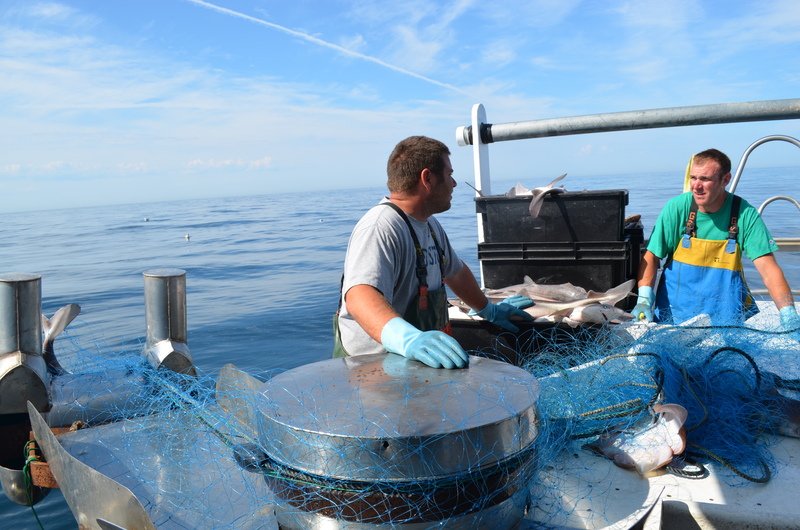 With the system currently in place, all NH commercial fishermen are required by regulations to notify the government 48 hours before they plan to fish, often making it difficult for many of them to plan out their work week. "I used to get up, and see if it's a nice day, and then go," shares Neal. "Now I have to give 48 hours notice. The future of fishing is not good." Neal feels mismanagement is to blame, using the overabundance of dogfish as an example. "It didn't used to be that way," he says with regards to dogfish. 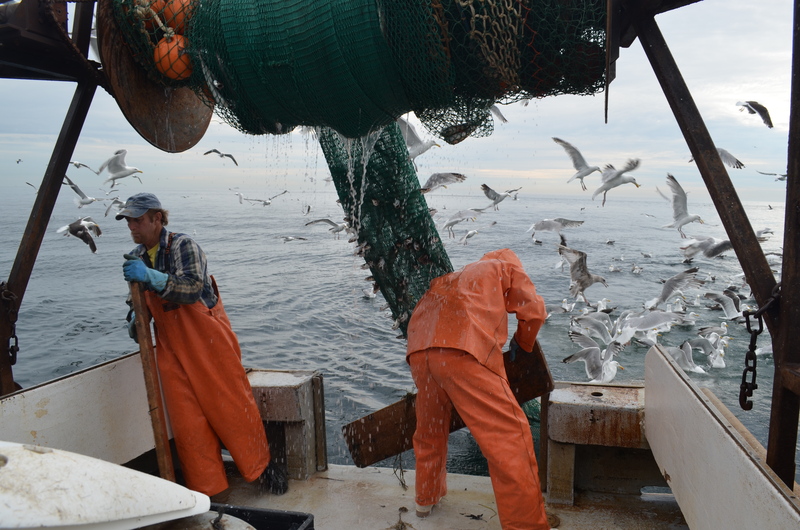 "People always say fishermen need to be held accountable, while management is not. They're above the law. Fishermen aren't to blame anymore." When asked what Neal does for hobbies he responds, “I fish...and I like to ride my motorcycle, a Honda Fury.” Neal Pike's catch is distributed outward via Yankee Cooperative. 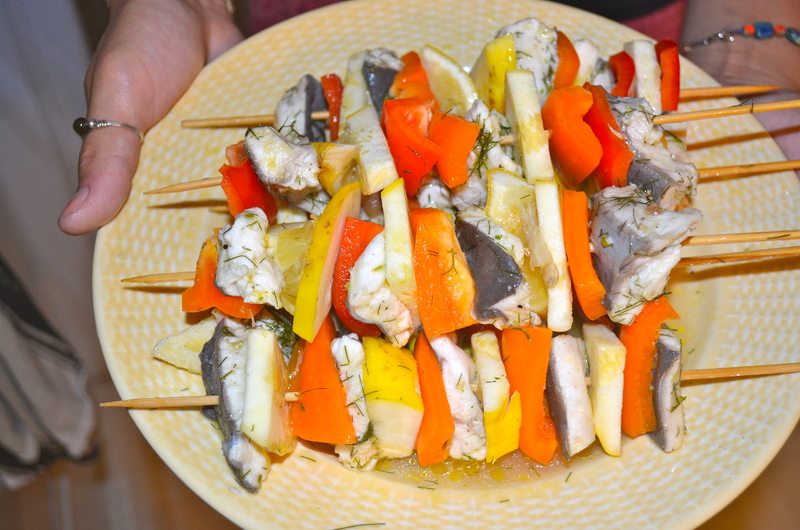 Most of his baitfish are used locally, while the whiting is shipped all over, and most commonly used for things such as the infamous fish sandwiches or fish sticks that can be found at various establishments around the country. Now Delivering to Manchester on Thursday Evenings!!! Posted 6/4/2013 9:40am by Sarah VanHorn. I'm happy to write to inform you, that due to ample interest in in-landers joining our CSF this past week, we've decided to rearrange our schedule to add Manchester to our list of Pick-Up locations. We plan to deliver fish on Thursday nights from 3 pm-7 pm in the Manchester Farmers' Market parking lot next to Victory Park. Make sure to select the Thursday, Manchester drop-off. Assuming enough of you sign-up right away, your first pick-up would be Thursday, June 13th. However to make this worth our while, we're going to need your help spreading the word throughout your Manchester community. We'd really like to get around 50 people in the Manchester area for it to really make the commute worth it. Do you think all of you can help us out?! Feel free to be in touch. We really do want to hear from you. Let us know what you think. And please feel free to share any ideas, progress, or further inquiries. And thanks for choosing to support our NH Fishing Community. Posted 6/1/2013 5:19pm by Andrea Tomlinson. 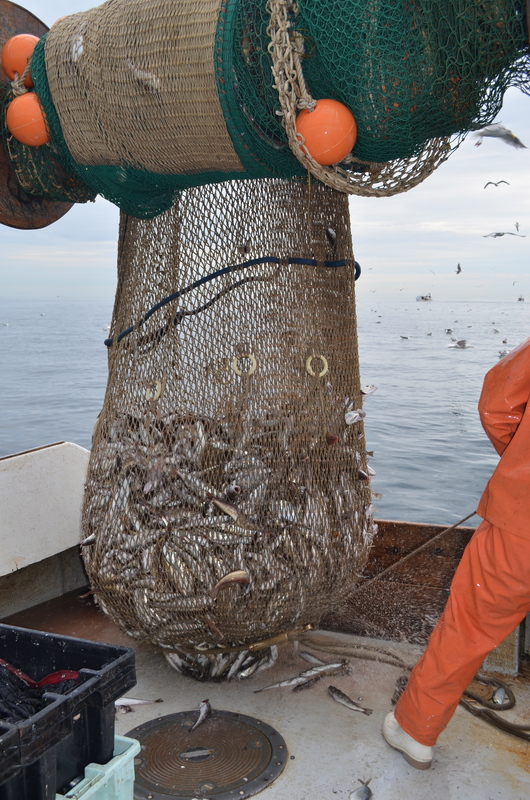 Happy 1st day of the NH Commercial Fishing Season! ...or maybe a combination of the two. First and foremost we'd like to Thank You for choosing to support our local seacoast's fishing community. We have received a tremendous amount of support these past few weeks and cannot thank everyone enough. Secondly, we'd love to fill you in on our progress these past few weeks as we approach the first week of drop-offs, Monday, June 10th. Today we spent our time sharing info about our CSF at Chowder Fest in Prescott Park in Portsmouth. We will also be at several Farmers' Markets this upcoming week as well. We'd love for you to stop by and say hello. Look for us at the Durham, Dover, and Exeter Farmers' Market this week. We finally have gotten our website up as you have most likely noticed. There are still some edits and hiccups we need to work out, but are thankful for your patience. We are not the most tech-savvy of teams here at our office in Portsmouth Harbor, but are doing our best to learn. We appreciate you sharing any issues you find with the site along the way. We have entered all the payments we have received for shares thus far via checks in the mail or in person. If we have received your payment we have entered it into the system, and you should have subsequently received an email saying we have done so. We are hoping to have a pay-pal account added to our site on the checkout page soon at which point you will be able to pay online. Until then we will be accepting checks made out to: NH Community Seafood. They can be mailed to: 1 Peirce Island Rd., Portsmouth NH, 03802. Payment is due by the first day of your pick-up. Any questions regarding payment please feel free to contact us via email or telephone. This week we are looking to finally purchase a refrigerated van to transport our fish from our processor, Seaport Fish, to you, the consumer, at our drop-off locations. We're hoping to have our logo painted on it within the next week or so to help our members better identify our vehicle. 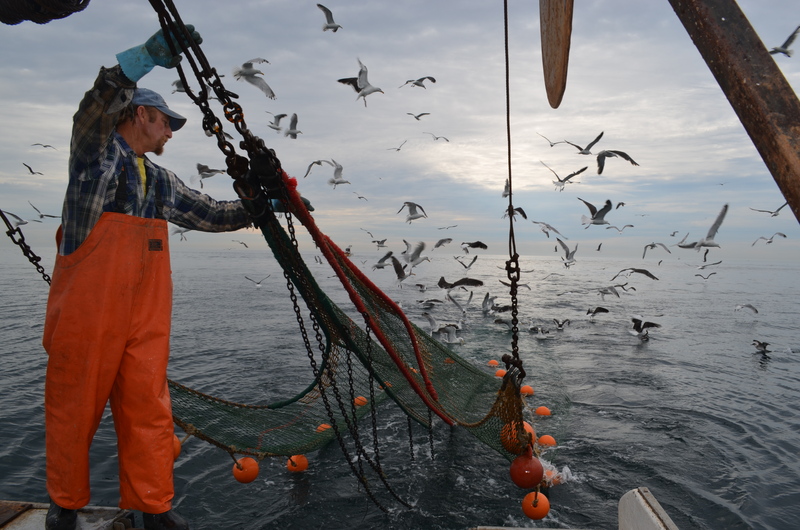 Also, we will be meeting with our fishermen this Thursday to discuss their involvement with the cooperative. So far they have had nothing but positive feedback. You can read about our guys on our site or on our Fishues blog featured on our homepage. We are fast approaching our first week of deliveries. Our plan is to inform you of what fish you will be receiving each week several days in advance in order to help you prepare. It is my intent to include recipes and ideas on our website each week as well. Additionally, we would love to hear back from our members about how you prepared your fresh catch; our Facebook page may be a great place for you to do so for those of you with an account. If you have any conflict with picking up your fish during your scheduled time, please let us know ahead of time and we will do our best to accommodate you. Don't forget to bring a cooler to transport your fish home, keeping your fish cool during those hot summer days. 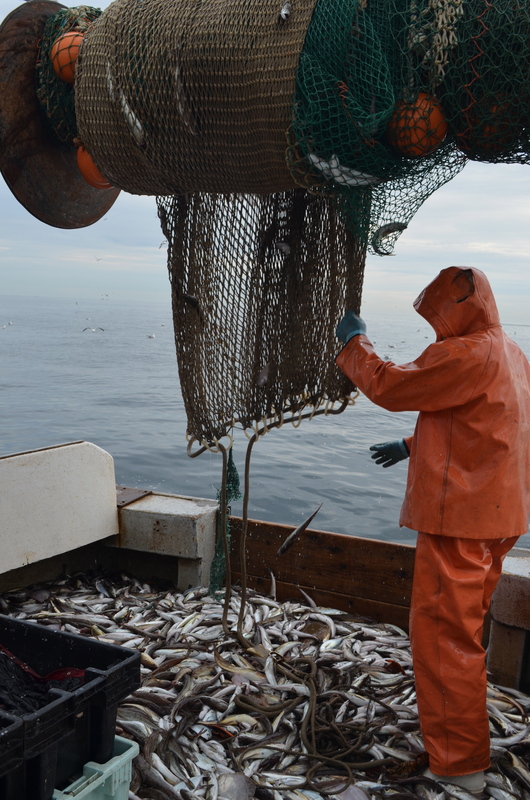 And don't forget to check out our blog page, Fishues: NH Seacoast's Fish Issues, from time to time, where we will be posting articles with news about our local fisheries. I think that may be it for now, although I'm sure I am forgetting something. If there's any additional information you are looking for, please feel free to contact us and I will do my best to answer your questions. Again we are so very thankful for your patience and support. We have been learning new things each and every day and are doing our best to stay on top of everything in preparation for our first 8 week season. We are very excited about the potential of this new cooperative and the possibilites for the future. Though we are taking it one day at a time, we eventually would like to include shrimp, scallops, lobster, in addition to including restaraunts, and possibly other drop-off locations, especially further in-state for those poor land-locked folk. Any suggestions or ideas are greatly appreciated. I fear I have begun to ramble, so I'm going to wrap this up. Can you tell I'm excited?! The fruit of our labor is finally coming together at a time when it is needed most. From here on out, I plan on writing more frequent newsletters so as not to overwhelm all of you, and to keep you in the loop. We would love for each and everyone of you to be involved in our local fishing community. May this newsletter find you well. Enjoy the beautiful weather & hope to see you all soon. Posted 5/25/2013 2:02pm by Sarah VanHorn. In New England, when people hear dogfish, one of the first things to come to mind is Dogfish Head Craft Brews, in fact it is the first thing to pop up on Google search. 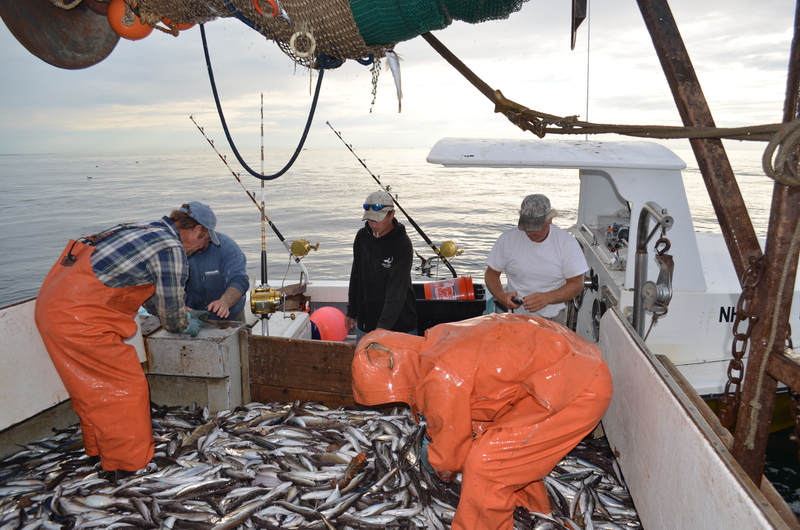 While many of us know Dogfish Head makes a fine 60 Minute IPA, what about the actual dogfish that are hunting our more valuable groundfish in packs just a short distance offshore here in New Hampshire? 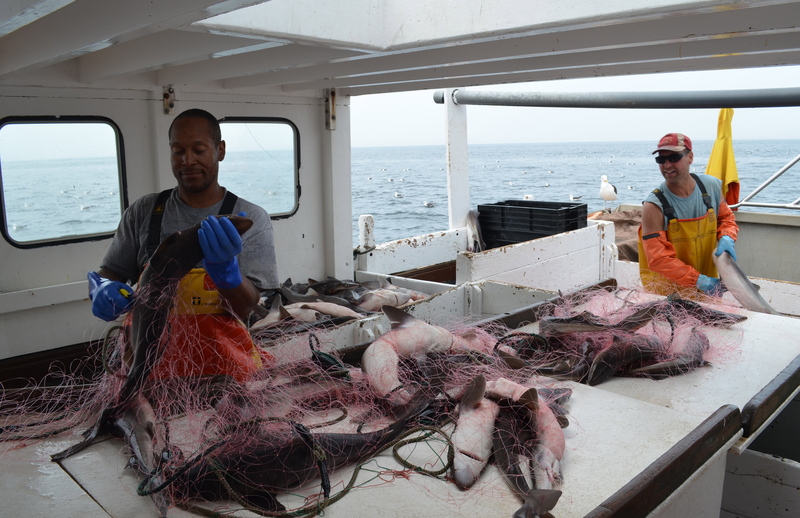 Having fished on over 14 commercial fishing vessels at the peak of Dogfish Shark Season throughout the Summer of 2012, it's become clear that there seems to be a serious fishue with regards to one of the most dreaded creatures by New Hampshire fishermen. Having been previously on the endangered species list, dogfish shark was overprotected by management throughout the past decade, mainly due to the fact that we know so little about the species as a whole. It's unclear at what age dogfish sexually mature, how long they live, where they spawn, let alone where they migrate to and from. Though over time, we were able to remove the species from the endangered species list, by overprotecting the species we have contributed to an infestation of dogs throughout our coastal waters, and for NH fishermen it has become a bit of a headache to say the least. 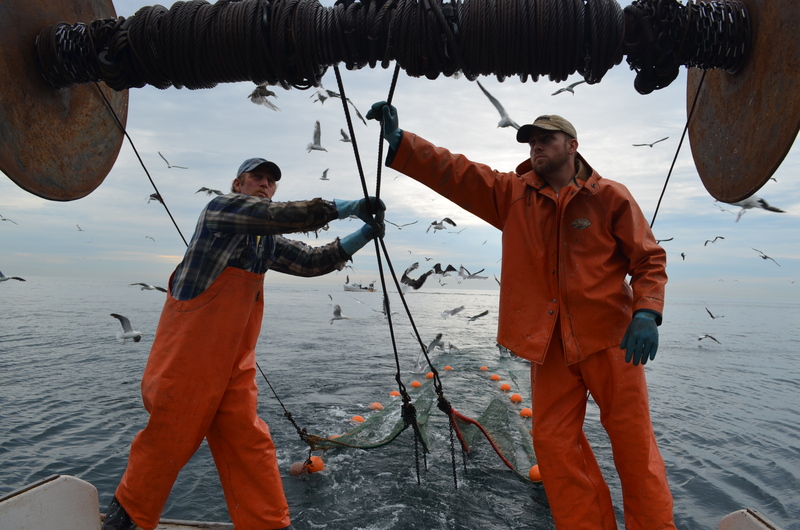 In addition to the massive amounts of work peak dogfish season creates for the NH gillnetter, they are most dreaded for the minimal fares they fetch at auction. In comparison to the more popular species of fish such as cod, haddock, and pollock, with some fetching auction prices as high as $4 a pound, dogfish prices hardly compare at around $0.50 a pound. And to make matters worst, dogfish are known for eating the more valuable groundfish, likely having a direct effect on the local fish stocks. 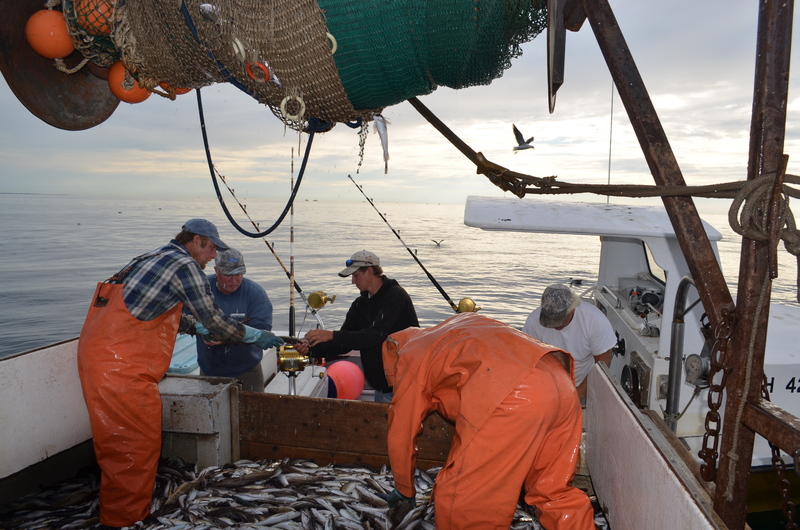 When gillnetters are catching lots of dogfish, it is likely they are catching very few groundfish. 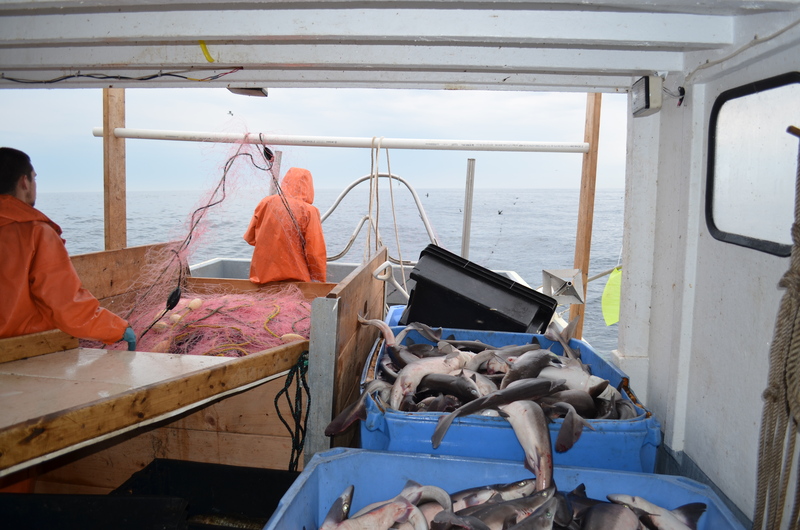 We are embarking upon the opening of Dogfish shark season once again. 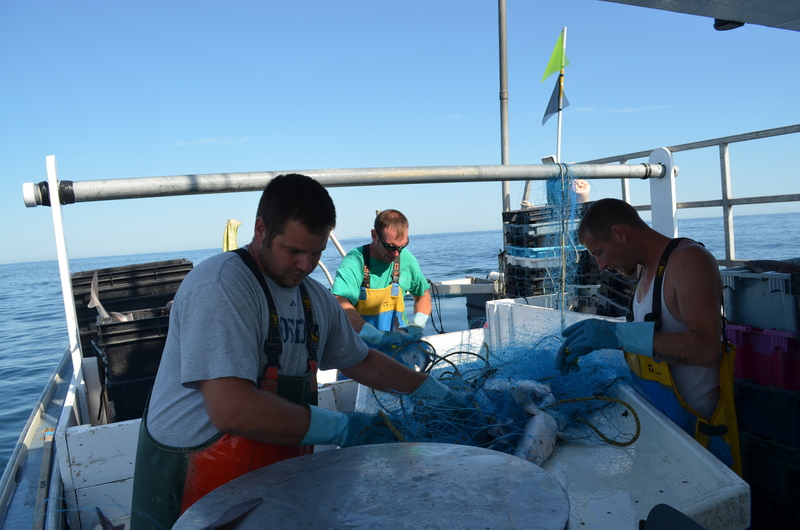 All last season, gillnetters had typically been filling their daily 3,000 pound limit after pulling in just one or two strings of nets, with an additional one to three strings yet in the water to be pulled in. That means nearly every day during the season last summer, over 10 or so boats were landing 3,000 lbs. of dogfish shark a day. 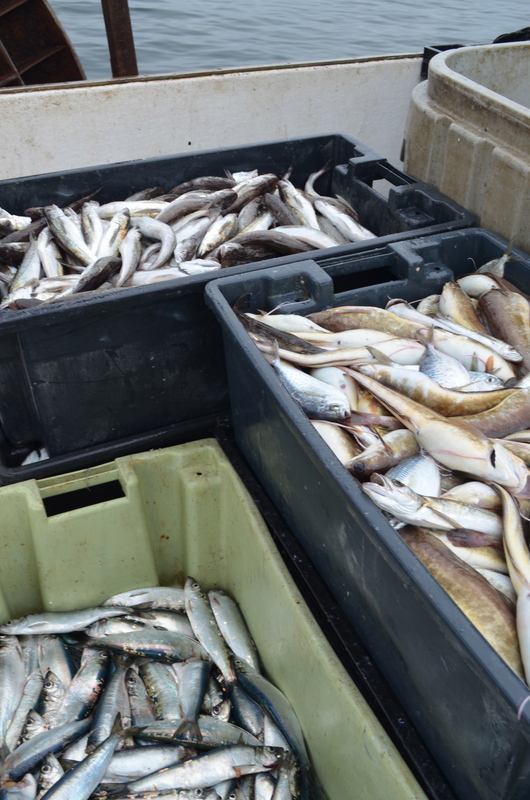 Since this past season, fishery scientists have come to realize the severity of the issue, and since have raised the alloted quota per boat by 1,000 lbs. increasing it to an alloted 4,000 lbs. a day. Which begs the question, if there are so many dogfish being harvested within our local waters, why are we not buying dogfish in local markets or restaurants? 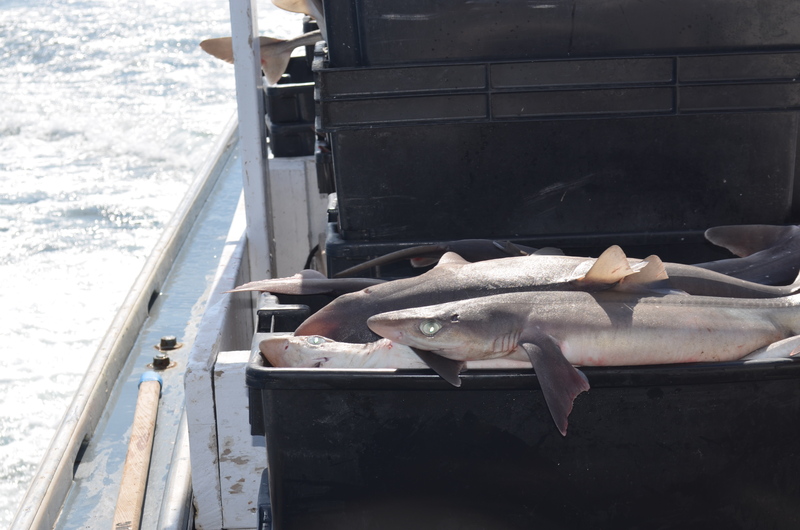 Aboard Heidi & Elisabeth, they call this getting "Dogged Up"
Why aren't we as citizens of the east coast not eating one of the most abundant species of shark during the summertime when it is most plentiful? It just doesn't make sense. Currently the majority of our Seacoast's dogfish is being shipped to Europe where it is most commonly being used as fish and chips, especially in England. Seeing as the majority of our seacoast's catch is being shipped across the Atlantic Ocean where so many others seem to love it, why don't we too? 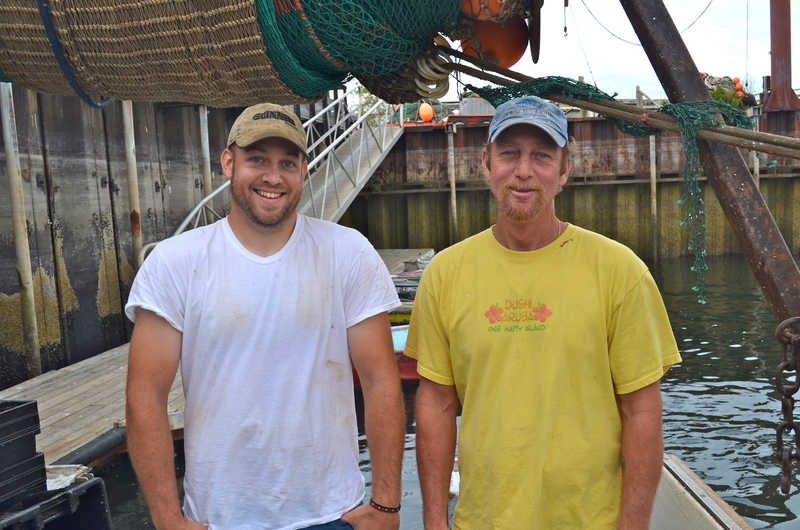 As part of New Hampshire Community Seafood's community supported fishery, we'd like to give you the ability to take matters into your own hands. We want you to have our fish first, especially our dogfish. Take your fish back from our friends across the pond, and try something new. 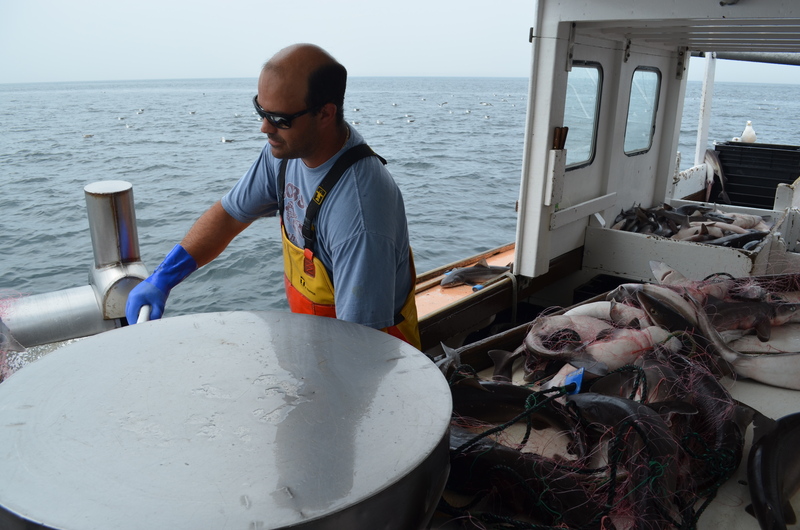 This upcoming season, our New Hampshire fishermen have agreed to provide our cooperative with an entirely new product, differentiating it from any other dogfish that has been offered within our Seacoast community before. 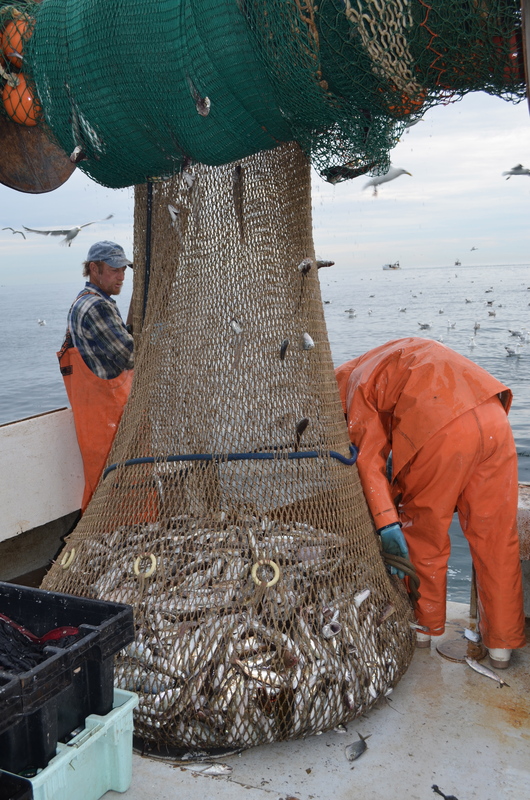 This season, our fishermen plan to gut, bleed, brine, and ice their dogfish immediately upon hauling it in, providing our CSF with the freshest product possible, and in doing so we as a cooperative are able to offer our fishermen a fair price for their catch. It's a win win for us all. By signing up for an Underdog Fish Share with our cooperative you will be given access to this diferentiated day boat dogfish, a product our commnity has yet to grow to love. 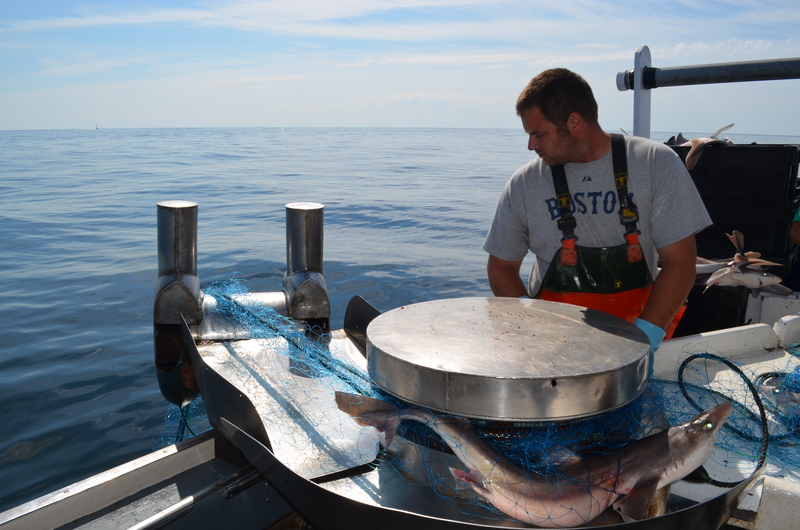 There's no reason our dayboat dogfish should be deemed unqualified for the average New Englanders' dinner table. Try it our for yourself. Ask for dogfish, and share with others what is happening in our local waters. Sometimes word of mouth can be the most powerful of tools in making a change. 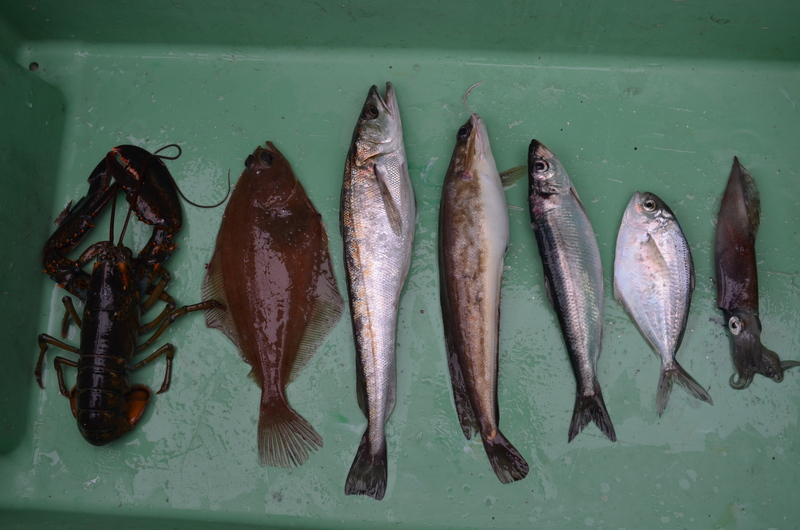 There's no reason we shouldn't be eating one of the most abundant species in our waters here on the seacoast. Posted 5/7/2013 2:18pm by Joshua Wiersma.